A group of journalists is to kayak around Lake Kivu - which borders Rwanda and the Democratic Republic of Congo - as part of a plan to launch a news agency in the region. Initially, they want to raise $40,000 via crowd funding to set up a website carrying local news; they would then plan to expand it into a regional video and press agency staffed by local reporters and cameramen. Marc Hoogsteyns, a Belgian cameraman who's worked in the region for many years, said, "The Kivu area in Africa has been known for decades for its wars and its misery and is often portrayed as ‘hell on earth’. I roamed the region for years looking for corpses, violence, corruption and misery. These things sell well to international press agencies. For us the moment has arrived to put things back in balance and to focus on the more positive aspects of daily life in this region." As a first step Marc plans to kayak around Lake Kivu in order to promote the new website. 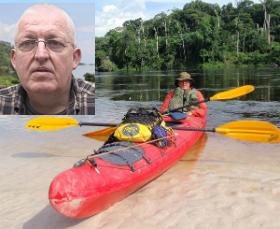 Two years ago he crossed the DRC with a kayak, paddling down the Lukenie river for three months before eventually reaching Kinshasa. He said, "My friends and colleagues told me that I was crazy to take this risk. But I survived and I re-discovered the real Congo; a country in which people can survive with a smile, a country of big solidarity and hope. I re-discovered the real Congolese spirit. The kayak-approach worked very well at that time and we are confident that it’ll work again on the Kivu Lake." The other journalists involved in the project are Tom Palmaers from Belgium and Belgian-Congolese cameraman, Patrick Vergeynst.